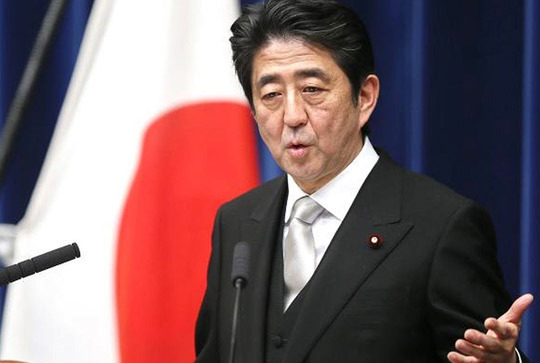 Prime Minister Shinzō Abe may now put off a schedule sales tax increase. Japan saw its main consumer prices fall during April, the second month straight the country has seen a drop as weaker consumer demand caused company’s to avoid raising prices increasing fears of deflation and further pressuring the countrys central bank to hit its tough inflation goals. An independent index which is overseen by the Bank of Japan also indicated consumer inflation had slowed down reaching nearly a one-year low and causing concerns over whether the underlying price trend is actually improving through the country’s significant stimulus program. The data highlights the delicate recovery of Japan and gives Prime Minister Shinzo Abe another reason to put off a scheduled increase in sales tax next year. The Japanese core consumer price index (CPI), which excludes fresh food costs and includes energy prices, dropped by 0.3 percent in April compared to the previous year, continuing a drop from March which was the largest yearly decline in the period of three years. Looking at the current month core consumer prices in Tokyo dropped by 0.5 percent, this was more than the median forecast of 0.4 percent according to Friday’s government data. Some analysts have raised concerns that Japan may fall back into deflation despite Abe’s most recent stimulus package which was designed to avoid ongoing price drops. He also noted that the Bank of Japan may ease its policy during June’s rate review. The Bank of Japan has been hoping that an improvement in the economy and consumer spending will boost corporate profits having a knock on affect with wages. This would potentially cause customers to spend more and strong consumption would see inflation accelerate. The country barely avoided recession during Q1 of 2016 whilst analysts are expecting flat growth in the current quarter as emerging market demand slows exports and slow wage growth pressures household expenditure.